Remodeling a bathroom is an exciting task. It is a great way to spice up your home and make the bathroom a more personal and functional space. 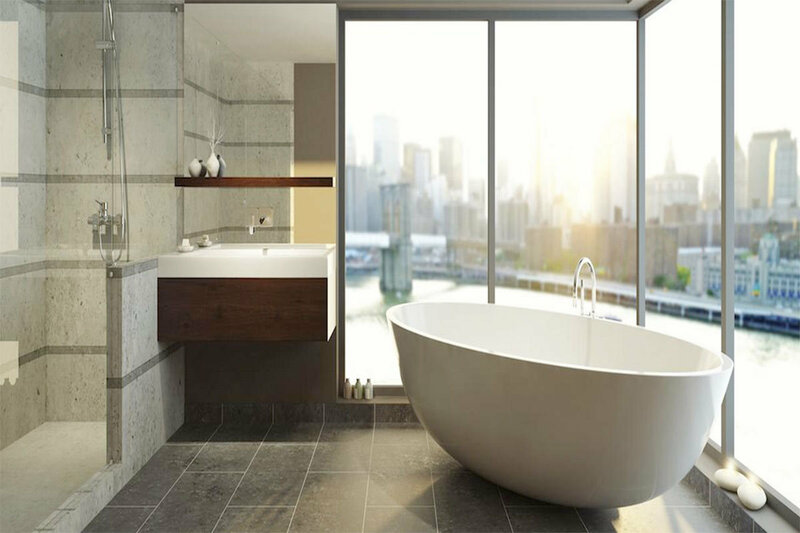 But before jumping into the fun part – choosing tiles, bathtub designs, etc, there are several less exciting things that you need to consider. Taking the time to consider each of the ten things below before starting your bathroom remodel will make the process much more efficient, affordable, and effective overall. Taking the time to sit down and come up with a budget is an essential step of any home renovation project. Decide on the amount you are willing to spend on your bathroom remodel and then subtract the cost of labor from it. The remaining amount is the money you have to spend on the fun stuff: tiles, fixtures, and other extras. Even a small bathroom remodel can take much more time than expected. It is important to have a solid estimate on the time it will take to complete the project. Talk to your contractor to see about how long their work will take. Factor in intermediate steps such as ordering and purchasing tiles, fixtures, and other extras. Time planning is especially important for those that only have one bathroom in their house. You need to know how long you will be without a shower or a toilet. “Full gut” is a term used by professionals for completely redoing a bathroom. If you are planning on a major upgrade, this is often a more effective route to take than leaving a few fixtures intact. A full gut will leave you with zero problems in your bathroom and increase the resale value of your home tremendously. Design and functionality go hand in hand during a bathroom remodel. It is necessary to plan with both in mind. Many people choose a single design item they love and then base the rest of the bathroom around it. Another plan of attack is to pick a design style and then select other elements that fit with this style. Take the time to make sure that everything that fits your design style is also functional. Even if you aren’t planning on selling anytime soon, it is important to consider resale potential when remodeling your bathroom. One of the most important factors to consider during a bathroom remodel is measurements. The size of your bathroom, the location of existing plumbing pipes and electrical wiring, and the dimensions of bathroom fixtures will greatly dictate what you can do with your renovation. Make sure to thoroughly measure your bathroom and fixtures and keep these measurements handy. Creating a scale model with graph paper is also helpful. You don’t want to attempt to shop without these measurements handy as that is a recipe for purchasing an item that just won’t fit. A “top to bottom” approach to remodeling is recommended by almost all building professionals. Starting with ceilings first, walls second, and floors third will prevent damage and mistakes. It will also reduce cleanup time. Remodeling a bathroom is a complex and tedious job. Unless you are only making minor upgrades or have prior remodeling experience, it is often a far smarter decision to hire a contractor rather than DIY it. There are numerous advantages to hiring a contractor. Chief among them is saving yourself from a load of misery and wasted time. It is easy to use our website to find a list of contractors with experience in bathroom remodeling in your local area. 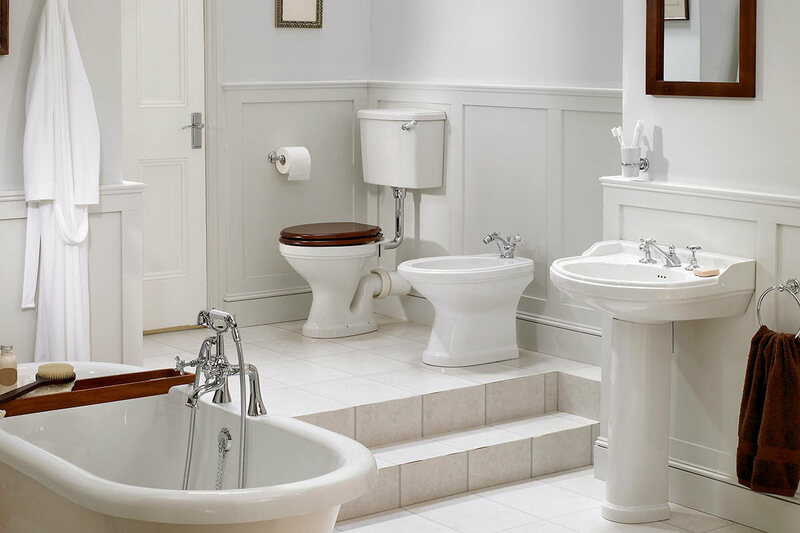 Naturally, plumbing is one of the most important aspects of remodeling your bathroom. Without it, well, you wouldn’t have a functioning bathroom, would you? Make sure to place particular emphasis on getting all of your fixtures up and running in prime condition. The shower, bathtub, toilet, sink, faucets, and showerheads should all be taken into account. 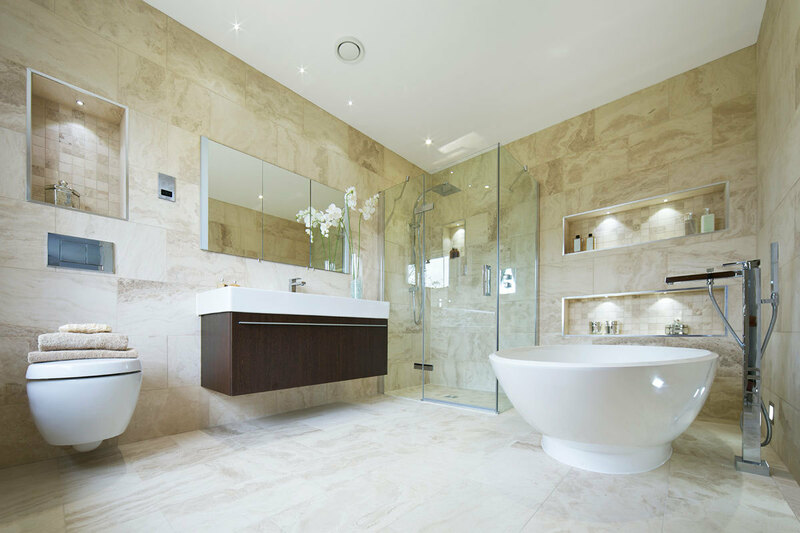 The walls and flooring of your bathroom are one of the easiest areas to update in a remodeling. You can use pretty much any material as long as it is waterproof. There is both natural waterproofing and waterproofing from a finish. Of course, budget and style preference will play into what type of walls and flooring you install, but common choices include ceramic, marble, and granite tiles. These are widely considered to be the most durable and handsome. Cement, sheet vinyl, and vinyl tiles are all other great choices for flooring. These are affordable options that look much better than they used to. It is also important to make sure that the flooring you choose is both durable and slip-resistant. Ventilation is a crucial, yet surprisingly overlooked, factor when it comes to remodeling your bathroom. Installing it is also a somewhat tricky task that needs serious planning. You need a good fan and you need to install it in the right position. Beyond this, you also need to make sure that the electrical wiring is on point. Poor bathroom ventilation will create a damp, moldy environment that is harmful to your health. 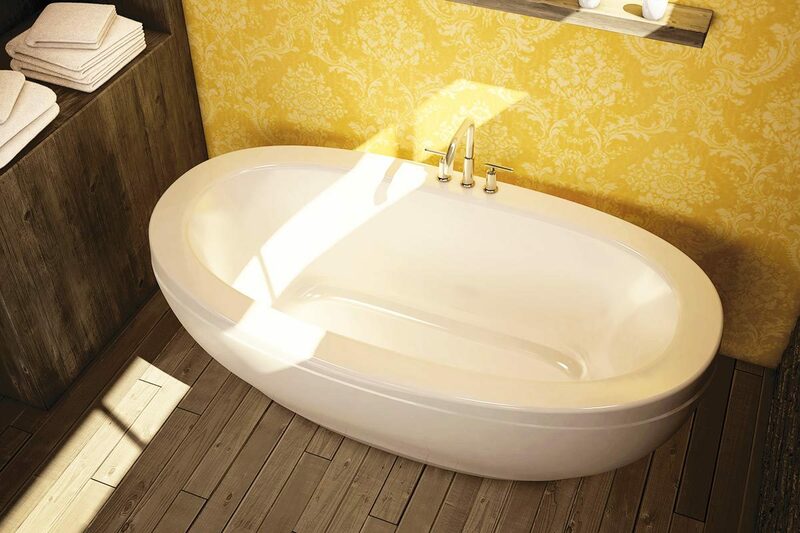 A properly ventilated bathroom also prevents decay of wood finish, trim, and fixtures. The housing market is currently trending towards going green and this doesn’t look like a movement that is going to let up any time soon. Even if you don’t have a personal interest in going green, making environmentally conscious choices in your bathroom remodel will improve your home’s resale potential. Furthermore, many green choices are budget friendly and also save you money on your utilities. For instance, a low-flow toilet uses less water, saving you money on your water bills.